MANAMA, Bahrain (AP) — Thousands of anti-government protesters threw firebombs and stones at riot police and burned tires in Bahrain on the second anniversary of the intervention by a Saudi-led force in the Gulf island’s crisis. Police fired stun grenades at the demonstrators protesting the intervention during the clashes in the mainly Shiite neighborhoods surrounding Manama. Starting early in the morning, the mostly young demonstrators blocked roads leading into scores of Shiite villages to prevent security forces from entering. The main Shiite opposition group Al Wefaq said 35 protesters were wounded in the clashes, including three critically. 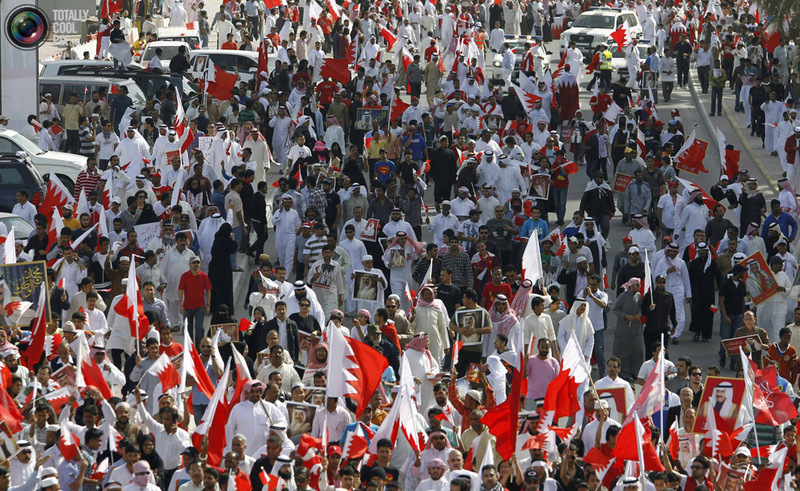 Saudi and other Gulf troops were deployed in Bahrain to help the Western-backed Sunni monarchy quell a wave of anti-government protests demanding a greater role for the country’s Shiite majority. Ameena Mohamed Hussain, a 21-year-old from the village of Diah, said she still carried a lot of anger from that day two years ago. The state-run news Bahrain News Agency did not mention the anniversary but reported that several villages saw “acts of terrorism committed by saboteurs for the purpose of intimidating and jeopardizing the lives of citizens,” including burning stolen cars and block roads with boulders and pylons. It said a “number” of policemen were injured. “All these acts of terrorism were committed by outlaws in order to prevent citizens and residents from going to workplaces or performing their routine daily errands,” the news agency said. Bahrain’s Shiite majority is seeking a greater political voice in the strategic Sunni-ruled kingdom, which is home to the U.S. Navy’s 5th Fleet. More than 60 people were killed in over two years of Arab Spring-inspired unrest. Al Wefaq and other main Shiite factions opened talks with government officials and Sunni envoys last week, but some hard-line Shiite groups oppose dialogue. Many Shites fear that the negotiations process will not weaken the monarchy’s hold on power. Opposition groups have demanded that the ruling dynasty relinquish much of its sweeping authority over the country’s affairs, including picking all key government and military posts.